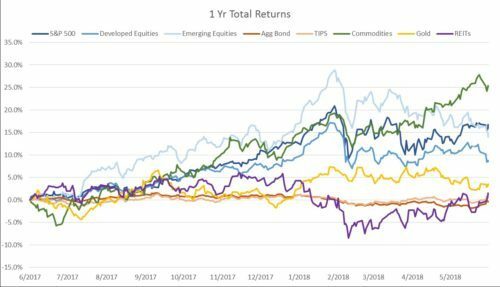 Almost all investors have experienced amazing results over the past few years, with their portfolios growing significantly regardless of what investments they held. Not only did portfolios increase in value, but they accomplished that growth with very little fluctuation. Hopefully this describes your experience too. It has been a fun, easy ride for investors recently, but it’s highly unlikely for this to continue much longer… If you want to ensure the health of your retirement, or even your ability to accomplish other near term goals over the next few years, be sure to consider the following points carefully – your financial future is on the line. Your portfolio must’ve been doing pretty well over the past couple years. Most major asset classes have experienced strong returns recently. 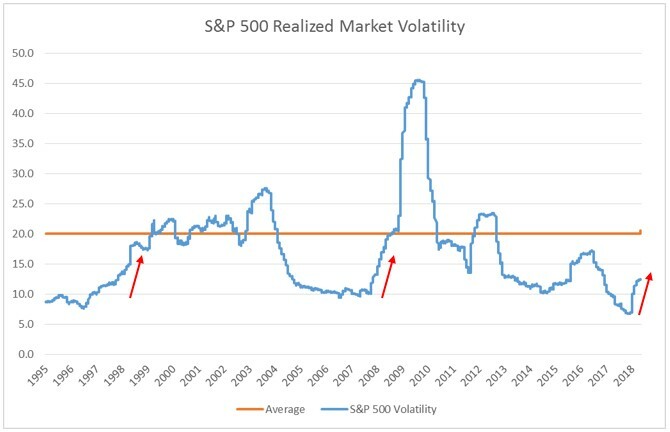 That’s the case whether you just look at the past 12 months or at the entire period of time since the market hit rock bottom in March of 2009. More specifically, the S&P 500 returned nearly 17% over the past year, which is impressive in itself, but even more staggering is the fact that investing in the S&P 500 when it was actually cheap in 2009 would have returned a whopping 21.3% per year on average! Can you honestly expect these unbelievably strong returns to continue indefinitely… or even just for another couple years? Source: Morningstar Direct daily total return data for SPY, EFA, EEM, AGG, TIP, DBC, GLD, & ICF. Momentum is measured by calculating whether the 3 month moving average price is higher than the 10 month moving average price for a given security. Your portfolio is probably dominated by pretty expensive/overpriced investments. Most investment asset classes became significantly more expensive as a result of prices going up across the board since 2008. 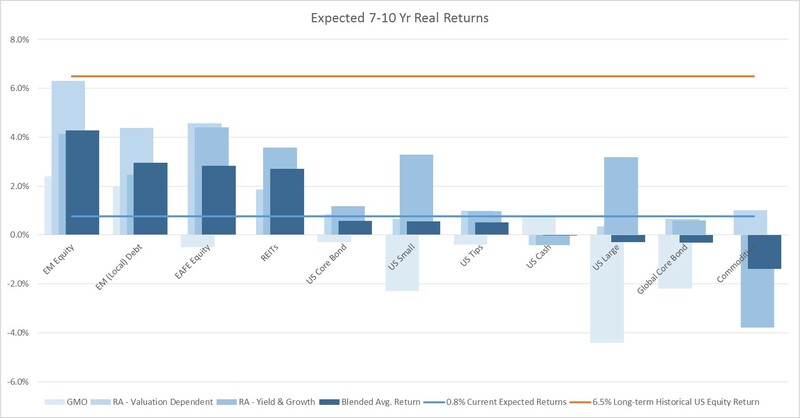 Given these currently overvalued or downright expensive asset classes right now, portfolio returns are expected to be muted over the coming years. Are you aware of how much the health of your retirement and your other financial goals will be affected by these weaker than average returns over the next decade? Will you still be able to accomplish your goals if your portfolio is currently positioned to only return an average of 2% over the next 10 years? Are you ready for the next market crash? Do you have a plan for how to handle your finances to prepare for the crash, and how to successfully navigate out of it? Like most US investors, you probably have the vast majority of your investment portfolio in US equities and not very much global diversification. During this difficult investment environment, one of the best ways to add value is to tilt investor portfolios in favor of asset classes with the greatest opportunity set (i.e. emerging market & developed international equities). Similarly, look to use relative valuation indicators to reduce portfolio risk from asset classes that have the lowest expected returns and are most likely to experience the harshest pullbacks (i.e. US large cap equities). Is your portfolio avoiding unnecessary risks and investing more into better long-term opportunities? Looking forward to the rest of 2018 and beyond, it’s unclear whether the current positive momentum in markets will be able to continue much longer or whether the technical indicators (momentum) will shift more in line with the fundamental indicators (valuations). Regardless of when or how the shift occurs, it’s critical that you keep in mind these low expected returns from a financial planning perspective, to ensure that you’re still able to achieve your unique goals despite a low return environment. Whether it’s a market crash, retirement concerns, divorce planning issues, or any other financial unknown, confirm with your own financial advisor that you’re financially prepared for all that life has to throw at you. Market Commentary Quit focusing on beating the S&P 500 and focus on what really matters!!! Quit focusing on beating the S&P 500 and focus on what really matters!!! The broader finance industry is constantly evolving and providing new challenges for practitioners and end users alike. Acknowledging this fact, the best way to effectively manage your own finances and the finances of others is to become a lifelong student of finance. Josh Street created the Student of Finance blog to share relevant and timely topics that are related to financial planning, investments, and managing wealth. The commentary on this website reflects the personal opinions, viewpoints and analyses of Joshua Street and should not be regarded as a description of services provided by his employer or its affiliates. The opinions expressed in this website are for general informational purposes only and are not intended to provide specific advice or recommendations for any individual or on any specific security. It is only intended to provide general education about the financial industry. The views reflected in the commentary are subject to change at any time without notice. Nothing on this website constitutes investment advice, performance data or any recommendation that any particular security, portfolio of securities, transaction or investment strategy is suitable for any specific person. Any mention of a particular security and related performance data is not a recommendation to buy or sell that security. Any indices referenced for comparison are unmanaged and cannot be invested into directly. Investments in securities involve the risk of loss. Past performance is no guarantee of future results.